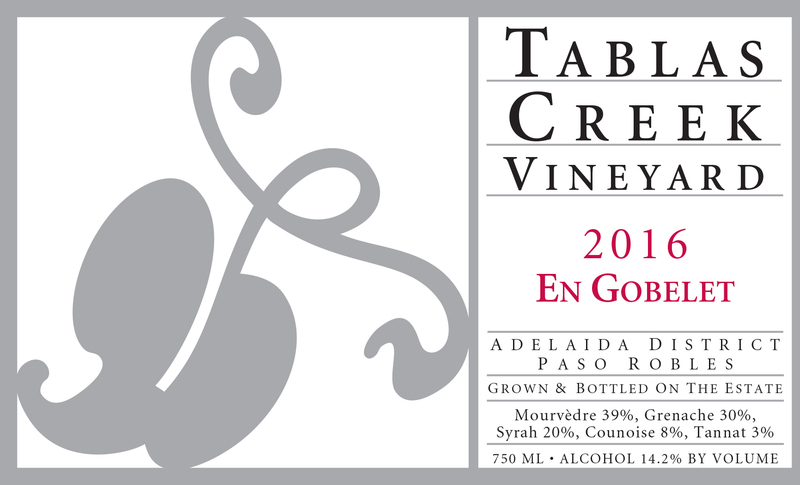 The Tablas Creek Vineyard 2016 En Gobelet is a unique blend of five estate-grown varietals, selected from head-trained, dry-farmed sections of our certified organic estate vineyard. We have felt for some time that the lots from head-pruned blocks share an elegance and a clarity that was noteworthy. Beginning in 2007, we created our non-traditional blend En Gobelet which combines the fruit, approachability and lushness of Grenache, the structure, earth, and mid-palate richness of Mourvèdre, the dark color and minerality of Syrah, the vibrant spiciness of Counoise, and the dark smokiness of Tannat. The 2016 En Gobelet shows an opulent nose, but with a cool undertone: currants and baking spices undercut by pine forest and mint. On the palate, black raspberry, plum skin, baker's chocolate, and rare steak are all emphasized by a salty mineral note. Vibrant and expressive on the finish, with notes of red licorice and chewy tannins that promise decades ahead. A wine that is by turns dark, and rich, and cool. Drink now or any time over the next two decades or longer. The grapes were largely havested from the section of the vineyard we call "Scruffy Hill" and fermented individually in small fermenters using native yeasts. After pressing, the wines were moved into a mix of neutral oak barrels and puncheons before being selected and blended in May 2017. The finished wine was aged in one 1200-gallon French oak foudre as well as a couple of older oak puncheons before being re-blended and bottled in April 2018.